This intimate Latin Caribbean–influenced bistro offers an array of uniquely flavorful selections and a few tasty pork choices including empanadas, delicately fried cornmeal pies stuffed with shredded pork and served with a savory aji dipping sauce made of olive oil, fresh cilantro, garlic, jalapeño and red pepper. The Cubano, a classic Cuban-style sandwich with tender bits of pulled pork, ham, Swiss cheese and house-made pickles on pressed French bread is buttery and finger-licking good. Served with thinly sliced, delicately fried, salted plantain chips and a demitasse of black bean, corn and tomato relish, this highly textural and flavorful combo will tantalize your taste buds. Enjoy the same succulent slow-roasted Cuban-style pork shoulder as an entrée served with maduros (sautéed sweet plantains) and spicy black beans with chorizo. While this unassuming eatery sits on a well-traveled, main thoroughfare, it’s in a section of Mid-City that until now has been rather neglected and is finally beginning to make some headway. The no-frills, no-fuss diner is bustling during lunchtime with those seeking quality and spice-laden cuisine at an affordable price. If you want pork with a Jamaican flair, then this is your place, and like the gentleman who took my order said, “I promise you won’t be disappointed.” Thinly sliced strips of dry-rubbed jerk-seasoned pork with just the right amount of heat are perfectly juxtaposed with your choice of cooling sides (I suggest the brown rice and peas and the addictive steamed vegetables) and sweet sautéed plantains. A side of fiery condiments accompanies the overflowing plate (one dinner portion is enough for two) that gives this already flavorful dish a piquant punch. Chef Chris Lusk’s power lunch, two courses for $16, is a great deal! One recent offering was a fresh, tasty bowl of gazpacho followed by a shredded pork po’boy that was both fabulous and filling. Pork cheek is gently braised in rye whiskey, rendering it succulent and tender, then placed between crispy French bread halves with tangy shavings of chèvre. The “smashed” po’boy is then drizzled with a creamy green tomato and white balsamic mayo, placed atop a bed of three-cabbage slaw and garnished with thin, fried sweet potato ribbons. The pork entrée (served at lunch and dinner) perfectly marries sweet and salty as juicy, skillfully cooked pork tenderloin is liberally encrusted with a yummy, nutty praline crunch. Opelousas sweet potato-turnip hash and haricot verts wrapped in a thick strip of honey-bacon laced with beurre noisette are the ideal companions to this tempting dish. If there’s one place in town that truly worships the pig, it’s Cochon. From snout to tail, chef/co-owners Donald Link and Stephen Stryjewski have mastered the art of frying, braising, stuffing, grilling and roasting pork at this swine-lover’s heaven. Adventuresome eaters won’t want to miss the fried pigs ears (crisp, delicate strips tenderized in chicken stock) served with a sweet-and-tangy cane syrup mustard. If you want to play is safe, then opt for the spicy, fall-off-the-bone grilled pork ribs with watermelon pickle or the comforting, home-style ham hock with sweet potatoes, pickled greens and black-eyed pea ham broth. The tender, juicy Louisiana cochon with turnips, cabbage and indulgent fried cracklins is pure bliss in a bowl! 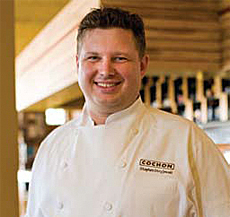 Let us not forget about Cochon Butcher, the little brother to Cochon modeled after an old-world meat market. With the addition of chef Warren Stephens, the meat-loving trio crafts beautiful house-made artisan meats and sausages and serves up delectable deli sandwiches and intriguing bar food like the slow-cooked pork tongue with cilantro, pickled onion and cabbage. Fear not, there’s less-exotic pork parts on both menus, from the cochon du lait Cuban to pork belly with fresh mint and cucumber on white bread to a classic barbecue pork with potato salad. A few pork-centric deli meats not to miss include the Kurabuto bacon, spicy fennel salami, breakfast sausage, pork rillion and spicy andouille sausage. Chef Paul Miller is not shy when it comes to seasoning at this legendary restaurant that put “blackened” on the culinary map, and his toothsome stuffed pork chop is no exception. Well-flavored chops are generously stuffed with a scrumptious blend of ricotta, Asiago, mozzarella and Caciocavallo cheese and fresh basil, then tossed into a cast-iron skillet to achieve that distinct, crusty blackened sear that makes your palate sit up and take notice. Topped with an aromatic Marchand de Vin sauce of proscuitto, red wine and mushrooms and served with veggies and a stuffed potato, this dish is sure to satisfy a robust appetite. For something a tad on the lighter side (and I do mean tad), check out the Cuban pork panini, a delicious twist on a classic, which is served at lunch. Here tender, slowroasted, thinly sliced pork, sliced ham, dill pickles, spicy Colby jack cheese and Creole mustard are artfully layered on focaccia bread. Kicked-up comfort food is artfully presented and impeccably flavored when left to the skillful hand of chef John Harris. This is never more than evident with his highbrow version of the classic BLT. Chef Harris starts with two thick slices of crispy sourdough bread, slathered with a lusciou herbed aioli, topped with baby greens, sweet roasted tomatoes and juicy, fatty, succulent chunks of perfectly prepared pork belly. And while his mouthwatering pulled-pork sandwich brimming with natural au jus and served with fries and a garlicky aioli may sound simple, it’s absolutely masterful. While selections do change and vary, I feel confident that any pig left in this master’s hands will surely satisfy your pork craving. Specializing in Spanish-influenced tapas with a local flair, it’s easy to get your pork on with one of several enticing pig dishes created by chef Glen Hogh. One of his most popular tapas and a mainstay at the stylish, casual Old Metairie eatery is the Moorish pork, über-tender cured and grilled pork tenderloin medallions that are nestled atop a blissful bed of crispy flash-fried spinach then finished with a heavenly horseradish sour cream. For lunch, enjoy the same divine pork-horseradish cream combination, but served in a pita pocket. Other pork pleasures include Raciones_(cured pork tenderloin and Jamón serrano with olives and accompaniments) and the deviously playful and delish Vega Dog, house-made chorizo (Spanish pork sausage) garnished with grilled onions and whole-grain mustard aioli and the flaky, ground-pork stuffed empanadas.